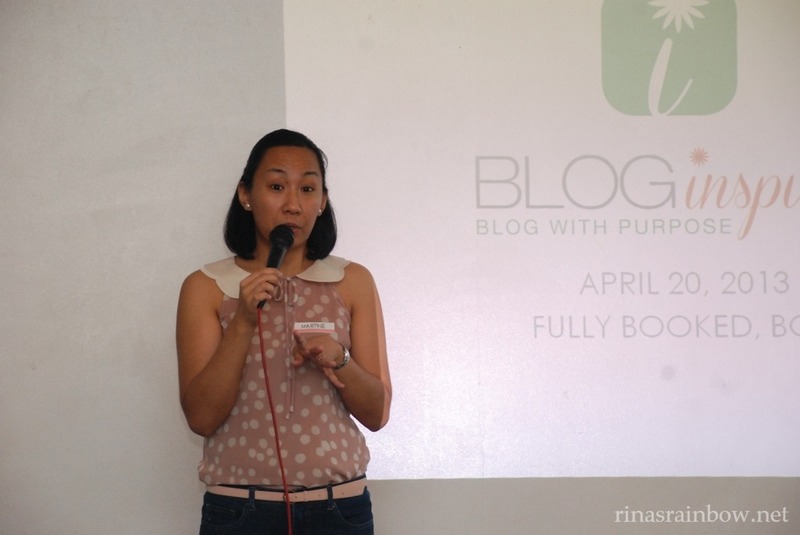 The idea of the workshop was to reach out to bloggers and share tips on how to make a meaningful blog. On how to have a strong blog foundation by having a clear blog purpose for blogging. This got everyone in the room really thinking hard and reflecting on their blogs. Why am I blogging? 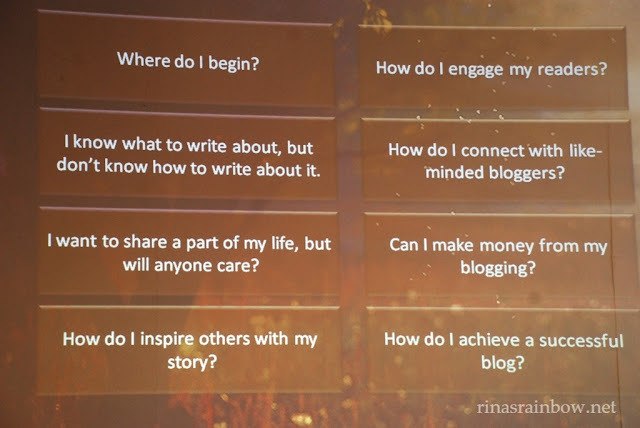 Who am I blogging for? When I first started my blog, I thought of just sharing the and reviewing the baby stuff I use for Rain. Baby bottle, baby slings, mosquito repellent etc. But is that it? I feel like it should be more. Or at the very least, it should be unique. Something that makes it "me". Then it happened. I hit a wall. 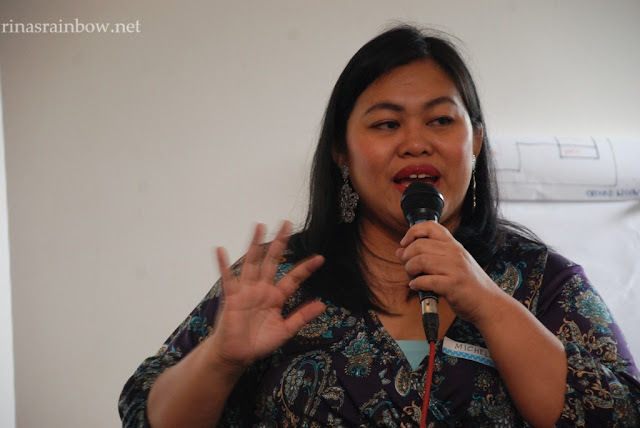 What makes me "me"? What is my blog purpose? Jayme Gatboton of Optimommy.com. 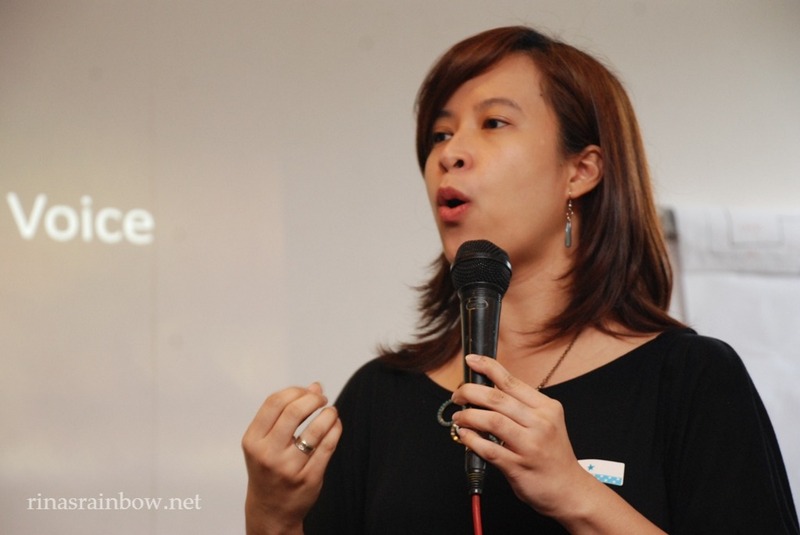 Such an inspiring passionate speaker! If you read my first blog entry, I explained that I am a rookie mom who doesn't have any expertise on anything. Taking photos? Maybe. But it's more of just a hobby. I'm definitely not a pro. And I never took any photography classes (except back in High School for a short elective class). Cooking? HAHAHAHAHA! That's funny. My cooking skill is limited to frying hotdogs. (But I am learning). Arts and crafts? Well, I love doing arts and crafts but for now I don't really have the time. Maybe when Rain is older. So what is it? What am I an expert on? For now, nothing. All I was thinking at that point was to explore and find something I will eventually "rock" as a mom. Maybe I could just stick to that? To simply go on with life with what I know now, learn from experiences, share those experiences and this journey in finding that one thing that will make me unique. (Just something I'm thinking about) What do you think? That being said, my purpose for blogging is still under construction. 1.) Where Am I? Identify your theme. 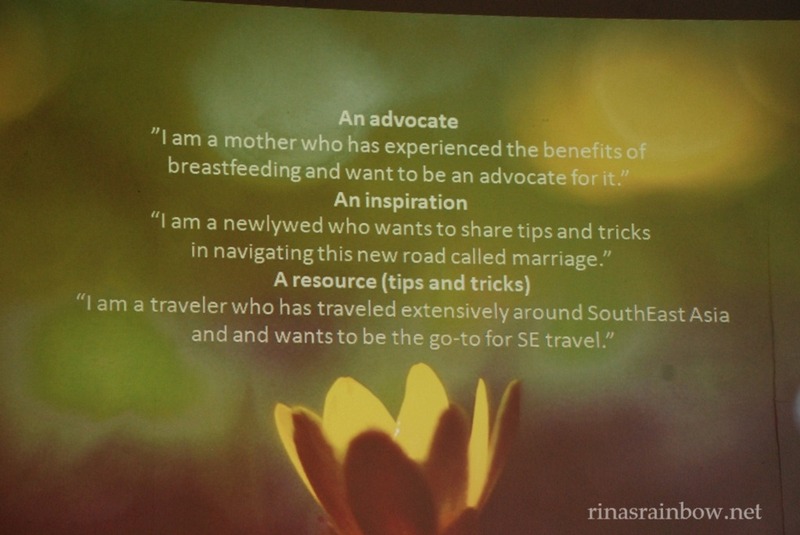 This can be anything under the sun like motherhood, foodie, work-related, or any of your expertise / passion. Mine is a blog of a rookie mom. 2.) Where do I want to be? Anchor yourself to something special. 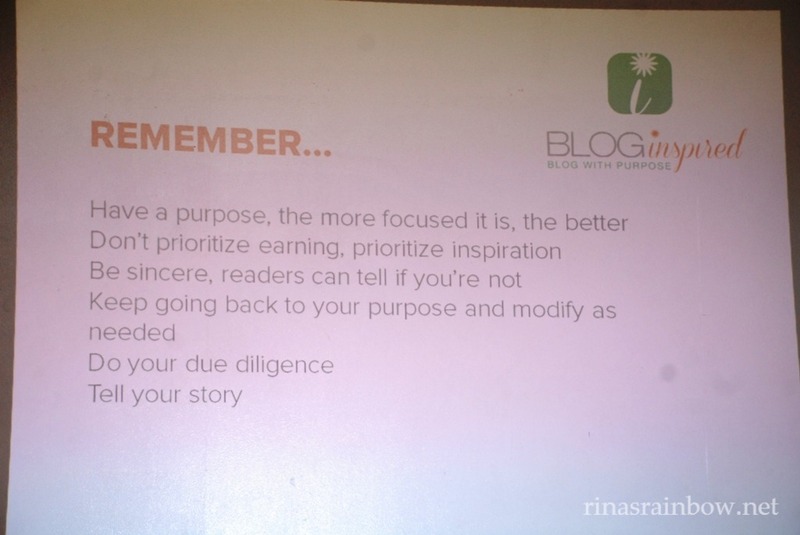 That thing that you want your blog to focus on. And from time to time, these anchors might change. But that's perfectly normal and okay. Just follow your passion. Your blog is a living document! Remember to do all these with your theme in mind. These are truly the makings of a strong blog! Being a blogger means somehow somewhere you will be able to touch someone with what you share to the world wide web. With today's technology, almost everything is online. Even socializing is now done online. And so Michelle Padrelanan of Beyond Silver and Gold explained to us that we must use these advantages to increase our blog's reach. 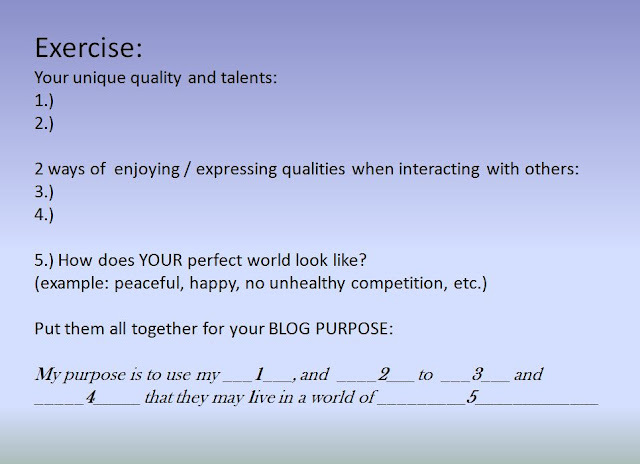 She suggests joining forums with topics connected to your blog's, leaving inspiring and helpful comments, etc. Just something to let them know you and your blog exists. Her blog focuses on home schooling, and she often receives a lot of free homeschooling books so she can write reviews about it. 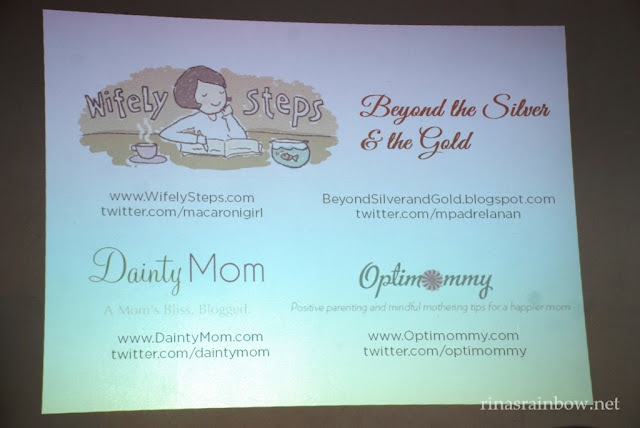 But she reminds us that although this tangible result is one of the perks of being a blogger, we also get intangible results which are new friends, the fulfillment of being able to inspire other families, and of course having an outlet for ourselves. More often than not, the intangible results are the best! Now that we were taught with more or less everything we need to be inspired, Martine De Luna took the stage and shared with us some tips on how to write as an inspired blogger. 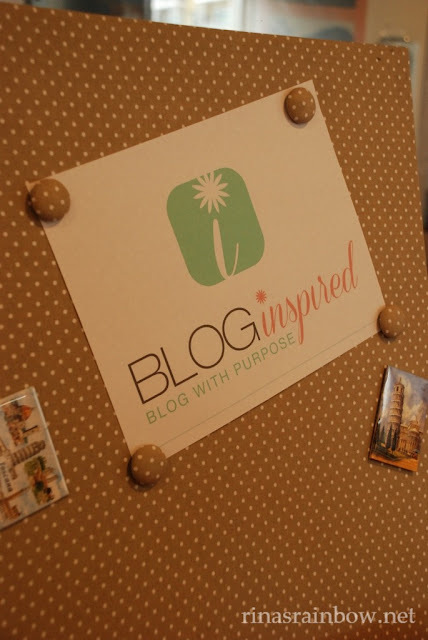 The thing is, once you have established your blog purpose, you will immediately feel one and at home with your blog. This means writing contents and ideas will be down hill from there because now you already have one clear purpose. 1.) Write down ideas ALL THE TIME. Sometimes we run out of topics to post about. Also sometimes, out of the blue we suddenly get ideas while washing the plates, or watching TV, or from chatting with your neighbor. Write them. These are possible topics you can write about. 3.) Be inspired by your "NOW" moments. 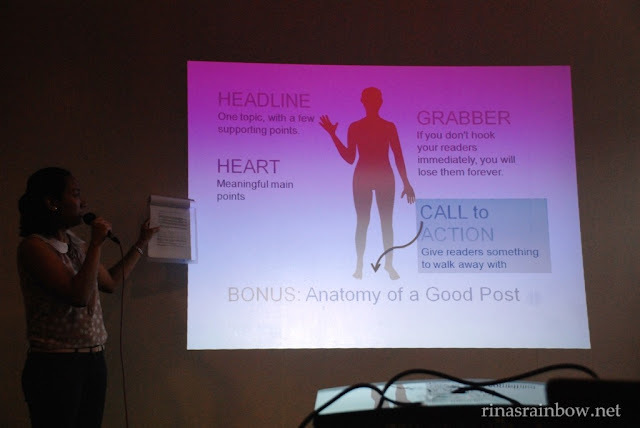 Readers are moved by your "AHA!" moments. "Now" moments pertains to things that you are just learning now. Share them right away if you thinl it is worth sharing. Like what I am doing right now. 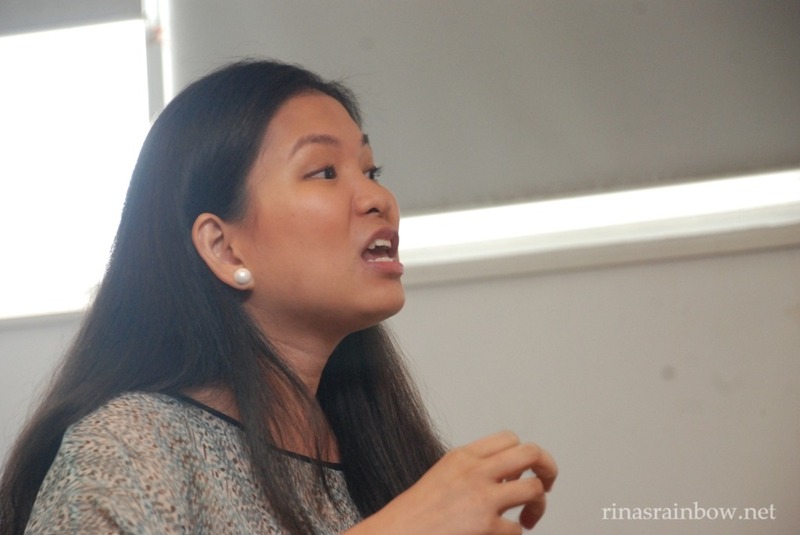 Attending this workshop is definitely an "AHA!" moment for me! 4.) Connect! Very simple. 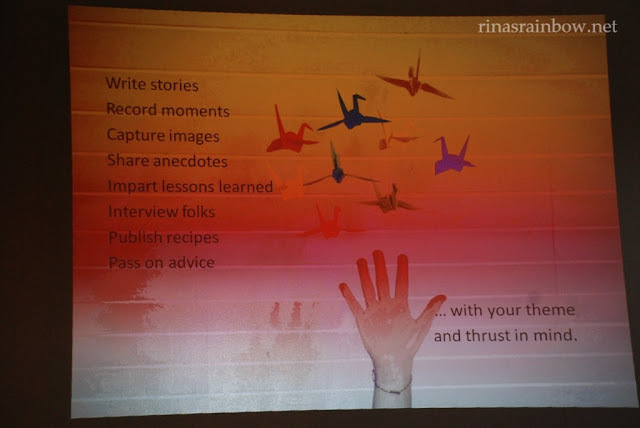 Attend parties, join blog communities, attend workshops, events, anything that can broaden your "network". 5.) Find a tribe that syncs with your purpose. Tribe meaning group of blogger friends. 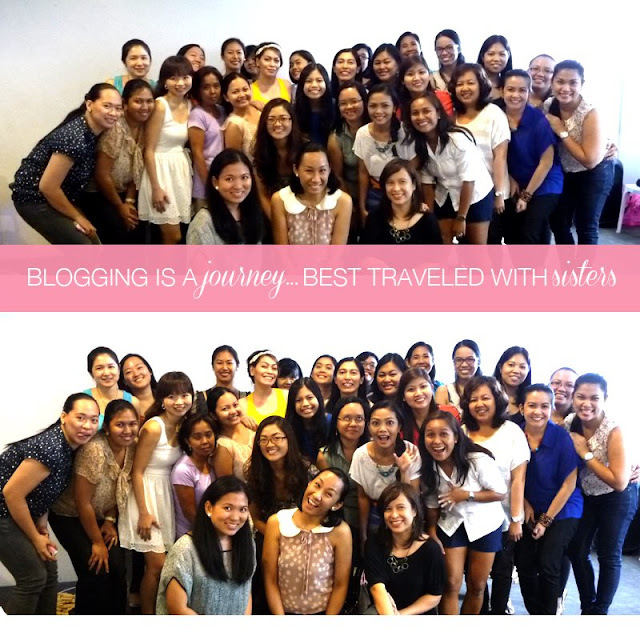 To quote Martine, "Because offline, you are not bloggers. You are friends!". Well said! So there. I tried to trim this post as much as I could but I just really learned a lot from these four amazing bloggers that I think everything is really worth sharing! Funny, I was having a hard time starting this post because I didn't want to write it yet without having a clear blog purpose for myself. 2 hours later, tada! A really long post! Hehehe. The four stars of the day! Hope you found this as helpful as I did! 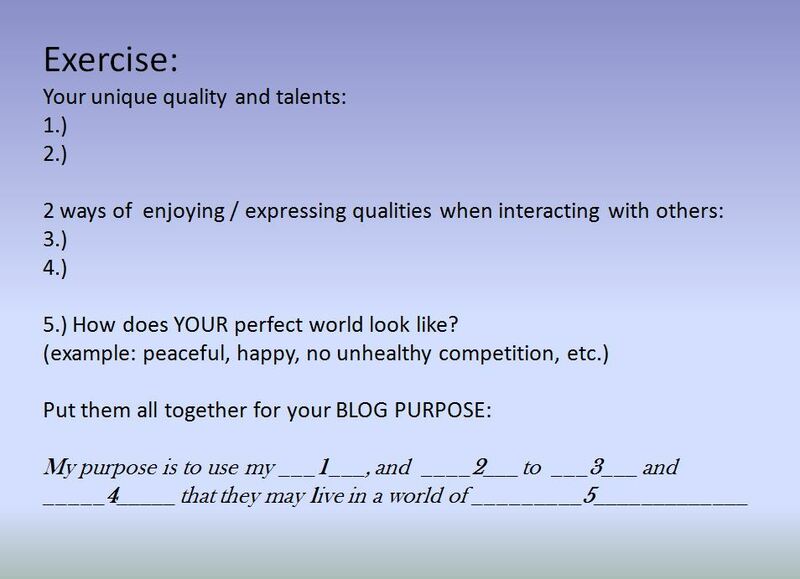 And hope this helps you find your blogging purpose! 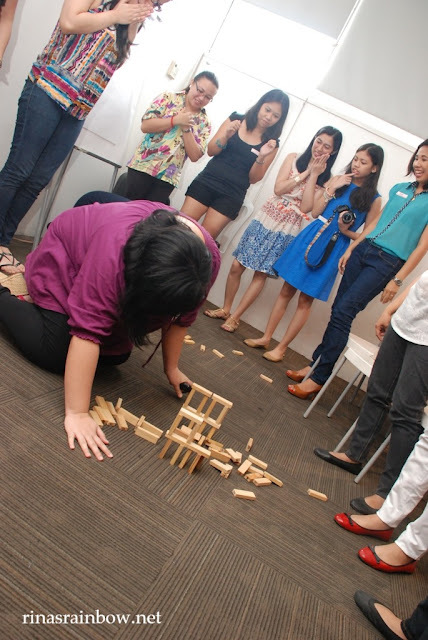 Thank you again Martine, Jayme, Toni, and Michelle and congratulations to a successful and inspiring workshop! Class Pic grabbed from Dainty Mom! :-) Check out the Blog Inspired Facebook Page here! Now I feel so shallow and purposeless, lol! Sayang talaga, I missed this event! I'll make sure to be there next time.